Visit our online store for all your slot car and hobby needs! We hope you all had a safe and happy holiday season. We've got some exciting things coming up in 2016 so be sure to check back often. Better yet, subscribe to the SpeedZone newsletter to be sure you don't miss any of the exciting news. Just a reminder, Advanced Gr 10 Racing happens every Monday night. Wednesday nights feature Drag Racing and Thursday night you'll find Hardbodies in action. Don't miss the flat track excitement on The Jersey Devil every other Friday. See our event calendar for all the details. Finally, we're looking to start a novice racing series this month. Email us if you're interested or call Rob at the store: 609.702.1500. We look forward to seeing you at SpeedZone Raceway & Hobbies in 2016!! Located in downtown Mt. Holly, New Jersey. The SpeedZone Raceway and Hobbies is ready to serve your need for speed. Experience the thrill of our 220 foot, eight lane Engleman road course. Watch as slot car dragsters fly down our scale quarter mile drag strip (85' long, 55' strip+30' shut down) at over 65 miles per hour. If you like high speed racing action you'll love the SpeedZone NJ. Check out our flat track "The Jersey Devil." 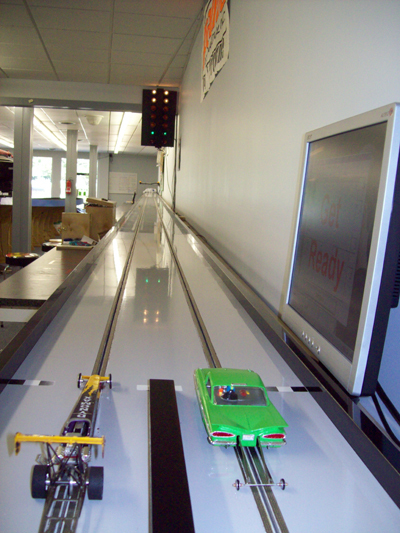 Installed by the masters at Gerding Fast Tracks, it's one of the best driving flat slot car tracks in NJ. SpeedZone is also home to some of the best Retro slot car action. We host the Retro East group several times a year. To see some some prior Retro rcing action go to SpeedZone on USTREAM.TV. We carry most major brands of slot car racing parts. 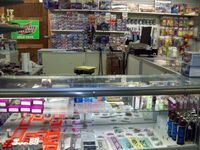 Check out our fully stocked parts counter. Let our experienced staff help you pick out the right slot car parts for your next project. Call Rob at 609-702-0146 for pricing details. Check our Slot Car sales page for specials. Did you know that we offer motor re-building and balancing on-site? You could be going faster! Get your motor re-conditioned or buy one of our blue printed Motors and start winning today! Don't want to build it yourself? No problem. Ask us about building you the slot car you've always wanted. A Winner! We have over 40 years of slot car racing experience and we know how to GO FAST! Interested in Pine Wood Derby racing? No slot car! No problem. We have slot cars and slot car controllers for rent. See Prices for Slot Car Rentals & Racing. All our slot cars are clean and work the first time out. Our rentals really fly, because we have the best slot car mechanics on our team. So what are you waiting for? Slot Car Racing is Fun for the whole family. See our Weekly Slot Car Racing Schedule and get to the SpeedZone NJ today! We cater to the hobbyist as well as the slot car racing enthusiast. We carry scale car models, pine wood derby racing cars, and model rockets. If it's fun, we have it. Don't see it? Just ask. We can get anything you need. We're open six days a week check out Hours and Directions to the best slot car racing in NJ.